In this post, we explore how to add authentication and validation protocols to your applications using OSCP and OpenSSL. I have been working on understanding and troubleshooting an OCSP implementation and learned a few things and thought I could share them on the blog. enables applications to determine the (revocation) state of an identified certificate. OCSP may be used to satisfy some of the operational requirements of providing more timely revocation information than is possible with CRLs and may also be used to obtain additional status information. An OCSP client issues a status request to an OCSP responder and suspends acceptance of the certificate in question until the responder provides a response. 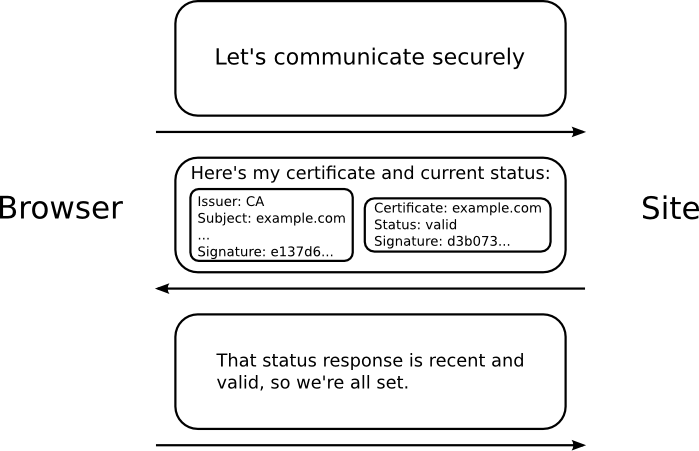 Basically, OCSP is a mechanism where a client can ask the CA if a certificate is valid. This method is better than a Certificate Revocation List (CRL). In the CRL method, the CA publishes a list of all the certificates with which it has issues and that have now been revoked. Instead of processing this whole bunch, the client can check the status of just one certificate with OCSP. Here are the steps of OCSP, as explained in the OCSP Stapling blog by Mozilla. With OCSP, the client is responsible for making a call to the CA (OCSP responder) to verify the status of a server certificate. This can cause additional round-trip delays. So an alternate solution was designed where the server could help. When the client initiates the TLS handshake, the server can include the OCSP validation message along with its certificate. By "stapling" the verification information, the client can complete the hand-shake faster. Allow TLS clients and servers to negotiate that the server sends the client certificate status information (e.g., an Online Certificate Status Protocol (OCSP) [RFC2560] response) during a TLS handshake. This functionality is desirable in order to avoid sending a Certificate Revocation List (CRL) over a constrained access network and therefore saving bandwidth. Again, here's the working of OCSP stapling from OCSP Stapling blog by Mozilla. OCSP verification has been around for some time and OCSP stapling has been baked into browsers for the past few years now. It is now gaining more widespread use as IoT devices have started to implement mutual authentication schemes. 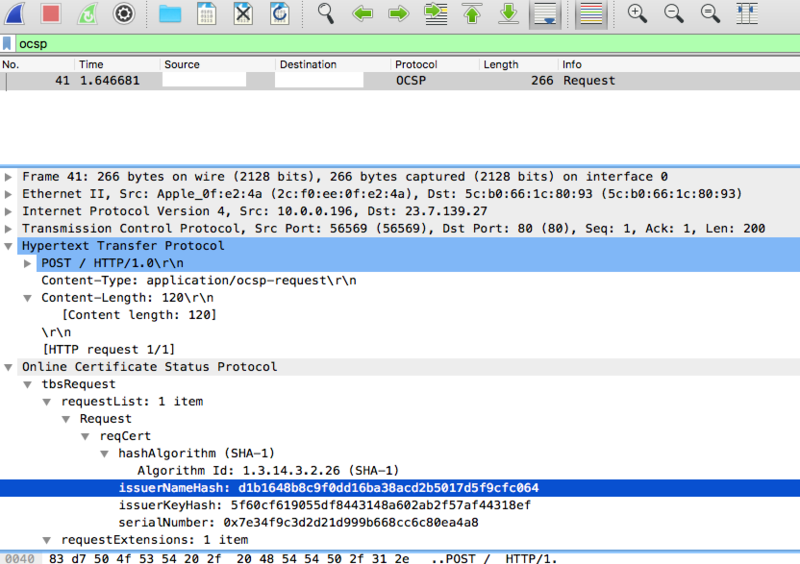 I had been working on an implementation that uses this OCSP Stapled response. The use case was that a connected device makes a request to a server over TLS. The device presents a client cert to authenticate itself to the server. The server verifies and then responds back with its certificate and the stapled OCSP response for the client to authenticate. We ran into issues over the stapling and we had to verify the result. For this purpose, I am showing a request/response that does not include client certificates. This just makes the discussion a little bit simple. First, make a request to get the server certificate. When using the openssl s_client -connect command, this is the stuff between ------BEGIN CERTIFICATE----- and -----END CERTIFICATE-----. I am using www.akamai.com as the server. The server certificate is saved as certificate.pem. Normally, a CA does not sign a certificate directly. They use intermediaries and we need to this make the OpenSSL command work. So, make a request to get all the intermediaries. To view the list of intermediate certs, use the following command. The very first certificate is the server certificate we saved in step 2. For all the certificates below it, copy and save to a file named chain.pem. So here, http://ss.symcd.com is the OCSP responder. Now that we have the server certificate, the CA certificate chain and the OCSP responder URL, we can make the actual verification call. Here's the relevant part of the response. The most important part is the Cert Status: good line. This indicates that everything is kosher and the client can trust the certificate. The other part of interest is the details Next Update. This indicates the OCSP stapling response can be cached until that time so that we don't overload the OCSP responder. If you notice, the "Cache-Control: max-age=329052" will be equal to telling the client to cache the response until the Next Update time period. So the POST request can be cached. OCSP request/response sounds a bit complex but, ultimately it is just an HTTP request/response and can be tested with simple command line tools. Published at DZone with permission of Akshay Ranganath , DZone MVB. See the original article here.